Liverpool legend Ronnie Whelan is anticipating a breakthrough year for Marko Grujic following an injury plagued 2016/2017 season for the Serbian. The midfielder has been at the forefront of pre-season analysis so far with many expecting him to become a valuable squad player for the Reds. 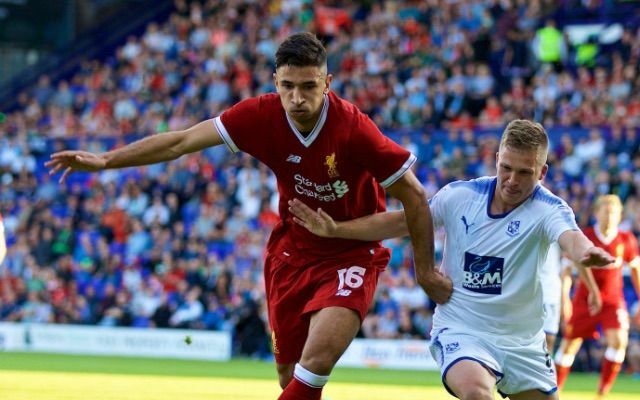 Grujic proved to be a standout performer in the club’s preparations last summer and continued that trend on Wednesday with an impressive display in his team’s friendly against Tranmere, in which he scored with an excellent long-range strike. Whelan believes the time is now for the 21-year-old to make a statement and challenge for a first team spot under Jurgen Klopp. “I thought he was very, very good in the game I saw him at Tranmere Rovers,” he told Liverpoolfc.com. Grujic boasts a strong reputation thanks to his bright 2016 pre-season alone and will get the chance to prove himself once again in the upcoming Asia Trophy. A useful blend of power, athleticism, composure and technique sets him in good stead to mould into a box-to-box asset capable of fulfilling Klopp’s desire to strengthen the spine of his team. Aside from his obvious physical advantages, he had the forward-thinking and, as Whelan pointed out, an intelligence to his game. Reds can expect to see a lot more from Grujic next season, providing he can stay fit.